Those were the conclusions of the Special Commission to Review Baltimore’s Public Confederate Monuments, which issued a report last August after hearing testimony from 165 individuals and wading through hundreds of historical documents. Ignored by the former mayor who commissioned it (Stephanie Rawlings-Blake) and referenced briefly by the current mayor who inherited the controversy (Catherine Pugh), the report is as eloquent and nuanced as yesterday’s swift take-down of the monuments was not. Understanding what the monuments “meant” when they were installed in the context of Baltimore’s racial and cultural history was a key part of the report. Baltimore not just implemented but aggressively pioneered ordinances and practices that tipped the scales of housing, education, jobs, transportation and access to public spaces against black residents. The City Council may seem like a weak vessel of government today. But back in 1910 it possessed formidable powers, which it used to pass a residential segregation bill that negated the U.S. Civil Rights Act of 1866, which decreed that blacks enjoyed the same property rights as white Americans. As Antero Pietila documented in Not in my Neighborhood, Baltimore became a national model of “best practices” in Jim Crow separation that was admired and mimicked by city fathers in the South and Midwest. The rapid growth of the city’s black population during the 1940s, following the beginning of World War II, was a demographic backdrop for these practices. Confederate monuments were an integral, if artistic, part of an ideology that glorified white supremacy and righteousness under the guise of honoring fallen soldiers. Take the Confederate Soldiers and Sailors Monument on Mount Royal Avenue. Sculpted by the artist F. Wellington Ruckstuhl, it depicts a winged angel that descends from the heavens to rescue a dying Confederate soldier. 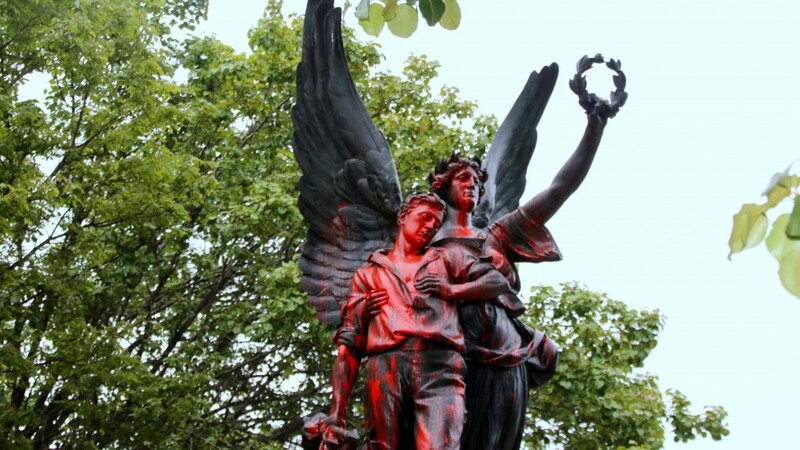 The angel, representing Glory, clutches the soldier as he holds his heart with one hand and grasps a Confederate battle flag with the other. The angel holds a laurel wreath, a symbol of eternity. The inscriptions on the pedestal are revealing. On the side: “Deo Vindice” (God our Vindicator), the motto of the Confederate States. The monument was the erected by the United Daughters of the Confederacy, Baltimore Chapter No. 8. A hereditary association of Southern women, the UDC was a pillar of the “Lost Cause,” a movement that depicted slavery as benign, lauded Southerners as a lost tribe of Norman nobility (as compared to the crass “Anglo-Saxons” of the North), and provided the foundation on which Southerners built the Jim Crow system, according to historian David Blight. The group is listed today by the Southern Poverty Law Center as a Neo-Confederate group that concentrates on preserving Confederate monuments, but whose members also migrate and cross-pollinate with other alt-right groups. 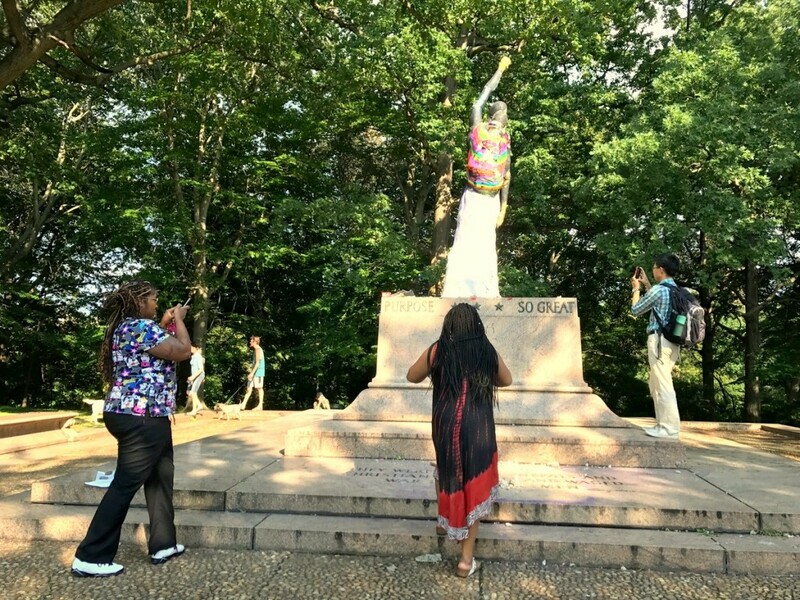 The same group spearheaded the Confederate Women’s Monument that, until yesterday, stood on the corner of Charles Street and University Parkway north of Johns Hopkins Homewood campus. The UDC didn’t finance the monument alone. In 1914, the Maryland legislature passed a bill that donated $12,000 for it. Created by J. Maxwell Miller, who taught at the Maryland Institute College of Art, it depicts two women, one standing as a sentry, the other kneeling and cradling a dying soldier who holds a tattered Confederate flag. Another telling detail: The soldier is lying on a bed of wheat, a symbol of resurrection and self-sacrifice. 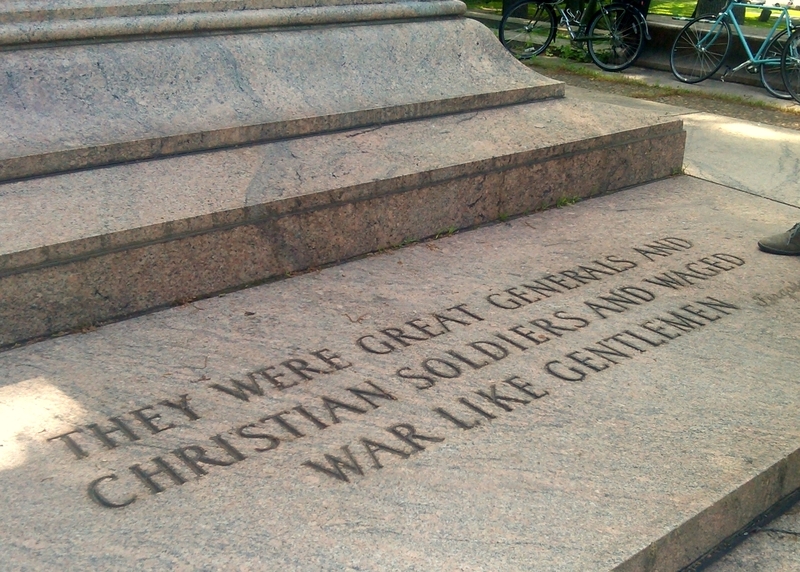 A third monument, erected in Wyman Park Dell, is the only one that depicts real people in the Civil War. Or rather, highly romanticized versions of Confederate generals Robert E. Lee and Stonewall Jackson. The monument was a gift to the city by J. Henry Ferguson, a local banker whose childhood heroes were the aforementioned soldiers. The sculpture of the two horseback-riding generals was executed by Laura Gardin Fraser, who won a design competition supervised by the city. The imposing stone base was crafted by John Russell Pope, who designed the Baltimore Museum of Art across the street. The Lee and Jackson Monument celebrates the Battle of Chancellorsville, where the South defeated the North amid horrendous casualties, including that of Jackson, who was shot by friendly fire. 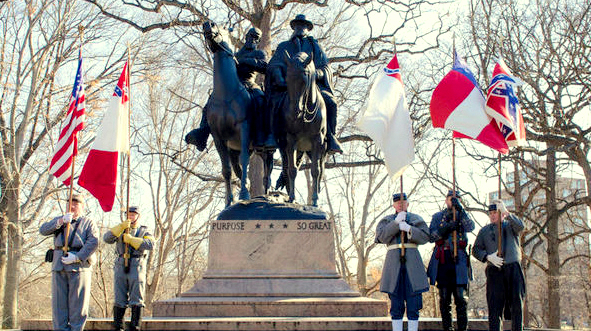 The final removed monument was not part of the “Lost Cause” movement from which the others sprang. Rather it was a copy of an 1872 original casting of Roger B. Taney, the chief justice of the Supreme Court, who was better remembered in Baltimore as the brother-in-law of Francis Scott Key. Occupying the north end of Mt. Vernon Square, the statue has been swept up in the Confederate controversy because Taney wrote the 1857 Dred Scott decision, in which the Supreme Court ruled that a black man, whether enslaved or free, could not be an American citizen. The ruling overturned an Act of Congress, advanced the cause of slavery and greatly aggravated tensions between the North and South that broke out into war four years later. The Monuments Commission had recommended to Rawlings-Blake that the Taney and Lee-Jackson monuments be deaccessioned and removed from the city’s public art collection. By a split vote, the panel voted to retain the Confederate Soldiers and Sailors and the Confederate Women’s monuments, but urged the mayor to place a plaque before them that explained to viewers why they were created and what messages they conveyed. The Rawlings-Blake administration did add some context to the latter two monuments, but failed to act on the others. Pugh said she was actively seeking solutions to the monuments issue, but such activity was not discernable before the Charlottesville confrontation placed the issue onto the national news and sparked local demonstrations. “Careful stewardship of our historic and cultural resources is essential to a vibrant, dynamic Baltimore. Each generation adds to, redefines and shapes the communities in which we live.